The most we've traveled in a single day since leaving Cape Town has been 114 kilometers. Aided by downhills and the sole run of tailwinds we've had to date, it is one of only a few days we've surpassed the 100-kilometer mark. Our plan for the next five days is to cycle one hundred kilometers, on average, each and every day. This time, we'll be traveling uphill. Into a headwind. Teresie, the Norwegian cyclist we'd been riding with since Elephant Sands, is in an even bigger hurry than us, and left Livingstone a few days earlier. Once more it's just Lauren and me. We carry out the now-familiar routine of cramming all our things into our panniers, lugging our bags over to our bikes, and returning our various bottles to their mounts. It is hot, and we are carrying plenty of water. We had the clever idea last night to freeze our water in the hostel's kitchen. We depart with four liters of ice each, frozen inside plastic bottles on our forks. We turn north from Livingstone, crank into low gear, and pedal for ninety minutes. By the time we stop for our first drink, every last crystal of ice has melted. The water is tepid. The narrow two-lane road from Livingstone to Lusaka is a busy one. There's a shoulder, but it's littered with rocks and broken glass and debris. It's made of a much rougher asphalt than the smooth tar of the main road, and riding to Lusaka in this shoulder would take twice as much time and effort as gliding across the yellow line separating it and the main road. We ride the yellow line. The drivers will have none of it. They blare their horns and speed past us at 120 kilometers per hour. They swerve around us recklessly and push us back into the shoulder. They're erratic and fast and a world apart from the calm, courteous drivers of Botswana. And it's not just the ones headed in our direction. Oncoming vehicles overtake each other without any concern for our existence or safety. They trespass into our lane and speed toward us, flashing their lights and honking their horns and suggesting that we should be getting out of their way. We become tense. There's a ready or not, here I come attitude to the traffic in these parts. We're given no room, even in the shoulder. Drivers honk at us just because. Trucks passing each other nearly crash into us as they go by. Though the Zambians we'll come to meet are wonderful, warm, and patient people, they, like most humans, become petulant inside an automobile. Entitled to the road, all of it, at full speed and without interruption. It grates our nerves and sours our moods. We do our best to stay safe. I strap a stick perpendicular to my rack, tie a red plastic bag to the end of it, and allow it to jut maybe fifteen centimeters into the road as a warning flag. Hey, folks, we exist. Could you please leave a little room? Within forty-eight hours, an oncoming van overtakes a truck, nearly runs me over, and catches the edge of the stick. It snaps off and flies ten meters down the highway. The driver does not stop. I replace the broken stick with a longer length of bamboo the following day. The road is busy and the roadside is busy, too. There were few cyclists in Botswana, Namibia, and South Africa. Here cycling is a common mode of transport, and plenty of Zambians are using clunky single-speeds to get between villages (they occupy both shoulders headed in both directions, making our ride all the more harrowing). In Botswana, we might travel a hundred kilometers between towns (and in Namibia, two or three hundred). Here we're passing settlements every few dozen kilometers. Women sell fresh tomatoes and onions on the side of the highway, and it becomes pretty easy to find a water pump every few hours. Zambia is filled with life and energy and smiles. We ride hard. We cycle all day, every day, for five straight days. With so much going on around us, wild camping becomes too difficult. We take to stopping somewhere just before dark and asking if we might have a little land to camp on, and people are all too happy to lend us a patch of dirt for the evening. We camp at a boarding school, a primary school, and two police stations. We count down the kilometers to Lusaka: five hundred, four hundred, three hundred. One day, we ride 116 kilometers. Our bodies grow sore and weary and in need of rest. Soon. It's Lauren's birthday. We wake to roosters crowing. We're camped in a teacher's yard, and the dust around us catches the early morning light. Today we will reach Lusaka. We stop mid-morning to refill our water bottles and use the bathroom at a petrol station. We're just forty-five kilometers from Lusaka now, and I ask an attendant how the road is to the capital for one riding a bicycle. "Oh," he looks alarmed. "You can't cycle there." Now I'm alarmed. "Why not?" Is the road closed to bikes? I nod my head in the direction of our heavily loaded steeds. "Um ... we're coming from Cape Town." "Oh," he smiles. "Then it's not too far." A few years ago, I was briefly featured in a documentary about keeping life simple. There was an American couple living in Lusaka who watched this film, found me online, and learned about our trip some months before we were set to leave. Earlier this year, they messaged to say that if we were coming through Zambia, we were more than welcome to stay with them. It was a tremendously generous offer, and we were eager to meet this family whenever we reached Lusaka, which at the time felt like it might be a lifetime away. Yet here we are. It's September and we're in Zambia. We let them know when we're set to arrive. Having spent the better part of the past two months sleeping on the ground in often uncomfortable places, we're happy to sleep almost anywhere. 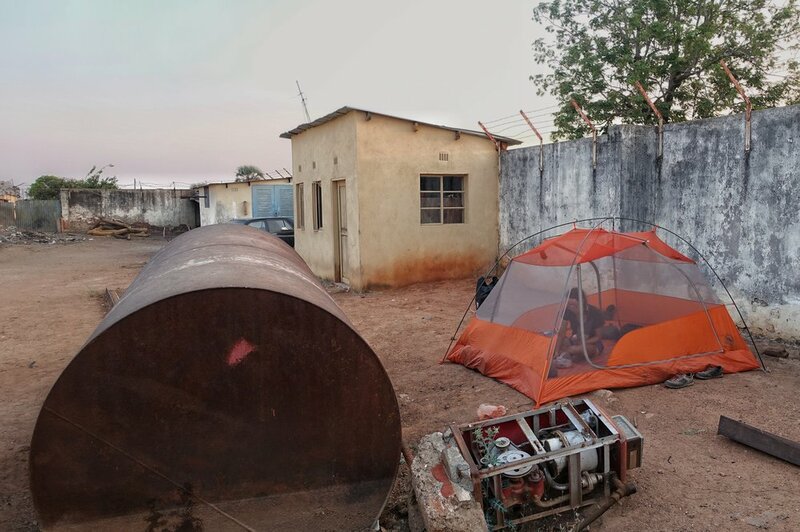 We never want to inconvenience our hosts, and we like our tent a whole lot anyway, so we head toward Lusaka eager to meet Sarah, Cassidy, and their kids and perfectly content to camp in their yard, sleep on their couch, or burrow away wherever they're willing to place us. But a few days out, Cassidy sends us a message letting us know that they've gotten us a room at the lodge right next door. You're welcome over to our place whenever, he says, but we figured this would give you two a little more privacy and independence. Don't touch the bill; it's on us. It's a really sweet gesture, and deeply, deeply appreciated. Sarah and Cassidy are both at work when we actually make it into the city, and so we check into the lodge, take a very necessary shower, and wash almost everything we own in the sink. 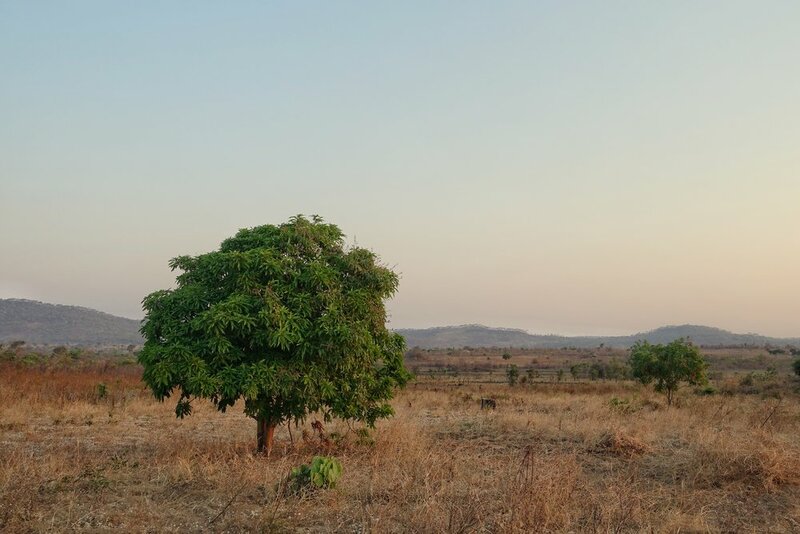 We grab a celebratory pizza at a nearby shopping center, toast to Lauren's birthday and our grueling five-day, five-hundred-kilometer sprint from Livingstone over a few cans of ice cold ginger beer, and return to the neighborhood that evening to meet our kind hosts. The family is lovely. The couple has three adorable, brilliant children, and the two older kids are emphatically curious about our journey. As Sarah and Cassidy finish preparing dinner, the children pepper us with questions. Where do you keep your stuff? Where do you sleep? Mom, when can we show them the cake? I'd mentioned that we were hoping to arrive in the city by (or on) Lauren's birthday, and our new friends have thoughtfully (and unexpectedly) taken it upon themselves to ensure the evening is something special. After a delicious taco dinner, Lauren is presented with a heaping chocolate cake baked by the kids and loaded up with every last birthday candle that could be found in the house. We have a fantastic time getting to know everyone over dinner, dessert, and drinks, and head to bed next door well-fed and very grateful. Our bodies need rest, and Cassidy and Sarah have so kindly invited us to stay (and put us up) for the weekend. And so we spend the following four days in a pleasant, busy blur. We run errands: changing our chains, sewing our clothes, picking up patch kits and a new cooking pan. We're led to a welder who fixes our baskets (falling apart after all our bumping around Namibia), repairs Lauren's bottle cage, and fuses together a fork and a spoon to replace the spork I'd lost in Livingstone. We patch a few of our punctures and we spend a lot of time off the bikes. We socialize. We go to the family's house for dinner and gin and tonics each night. Over the weekend they invite us by for pancakes. We take the kids to the pool and show them our tent and stove and have light-saber deathmatches in the front yard. We read the children bedtime stories and listen to them practice violin. They speak French, and we crack them up with our horrible French accents. Cassidy and Sarah host a barbecue over the weekend; we have a great time meeting their neighbors and friends. On Saturday, they take us out for a night on the town, treating us to drinks at a chic bar and a fabulous dinner at a Thai restaurant. We join Sarah and some other expats for yoga in their garden. It's one of the best weekends of our trip, and I'm thankful for the curious serendipity that has brought us to together. One more word about that. Back in fifth grade, I had a friend named Sang. We went to elementary school together, graduated into different classes or different schools, and as can happen with little kids, we fell out of touch many, many years ago. We haven't spoken in over fifteen years. In the meantime, I hit puberty. I cut my hair. I changed my name. I got taller and built a little house and was briefly featured in a documentary about my life in that little house. The one that got us introduced to Cassidy and Sarah. Earlier this year, Sang saw that documentary too. And unbelievably, she recognized me through the puberty and haircut and name change, found me online, and said hello. I said hello back. We caught up briefly on a few decades of our respective lives. I mentioned I was headed to southern Africa this fall. She mentioned she might be moving to southern Africa this fall. We promised to keep in touch come fall. In mid-September, Sang moved to Lusaka. Lauren and I arrive just a few weeks later. 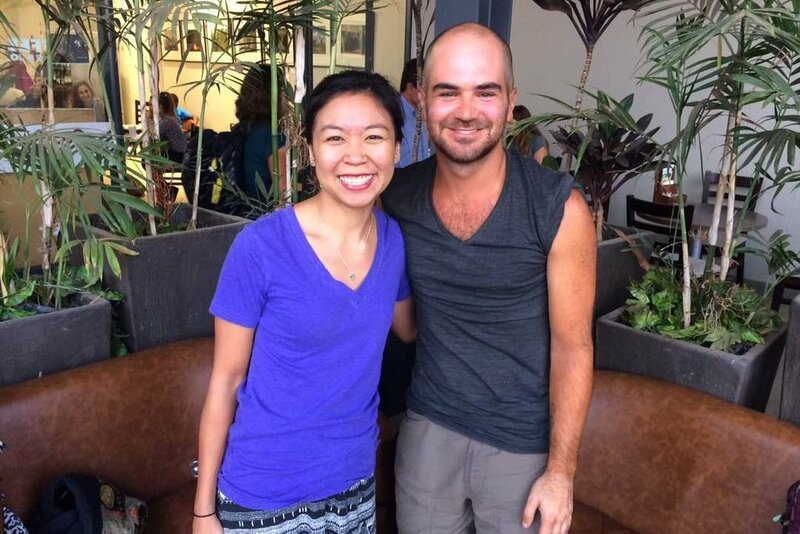 We grab coffee, catch each other up on life, and marvel at this strange, chance reunion. So we spend our time in Lusaka with new friends and old friends. We meet up with Teresie, too, the Norwegian woman we'd parted ways with in Livingstone. She'd made it to the capital a few days before us and is setting off for Malawi a day or two ahead of us. It's great to see her again, share stories about the arduous ride to Lusaka, and compare notes on the road ahead. Though we won't be riding together, we're confident we'll see her again somewhere in Malawi. The weekend draws to a close. We say goodbye to Cassidy, Sarah, and the kids, whom we've grown so close to in just a few short days, and thank them for making our time in the city so wonderful. We promise to cross paths again, somehow and somewhere. And then we saddle up, get ourselves to the start of the Great East Road, and begin the six-hundred-kilometer journey to Malawi. We descend. 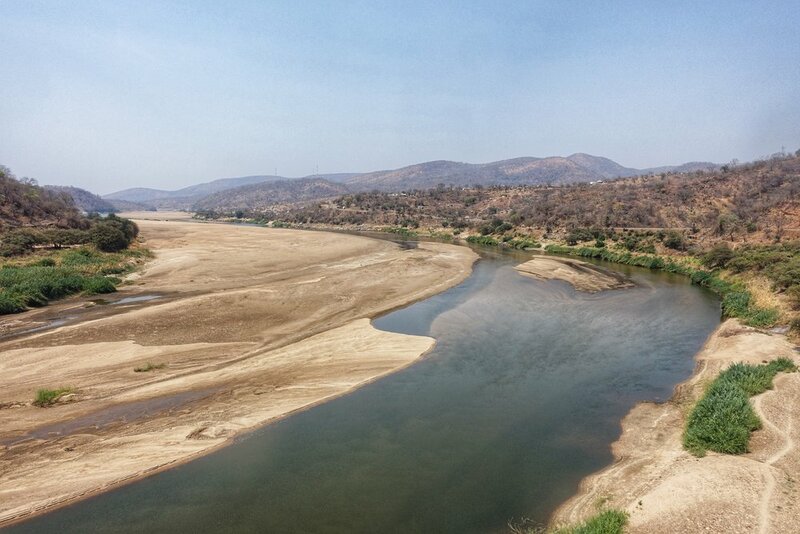 After some tough climbing, we lose thousands of feet in elevation in our cycle down to the Luangwe River. It's the lowest we've been since crossing the Orange River separating South Africa and Namibia. It gets hot. As a rule of thumb, temperatures increase by 3.5 degrees Fahrenheit for every thousand feet of elevation lost. So it's over ten degrees hotter here than it was just a few days earlier in Lusaka, where we already felt it was pretty damn hot. We begin to ascend. It's miserable work, slogging up mountains in 100-degree heat. The road curves and climbs and plummets. Up, down. Up, down. Up. Up. Up. We take the hills at speed. We come up over a pass and fly down the other side, pedaling hard and crouching low and gathering whatever momentum we can to carry us up the next big climb. There is always a next big climb. Heat, climbs, and road work. These are our days. We rise early and click into our lowest gears and pant along from one construction zone to the next. We detour onto bumpy gravel serviceways where the main road, brand new but improperly built, has buckled under shoddy design. We are deep in the mountains. It is midday. I am covered in sweat and salt and dirt and grease. I am encased in a film of grime. The sun bakes the valley, and the air around me is thicker, heavier, and hotter than my core temperature. I am climbing my twentieth or thirtieth hill of the day. The pavement gives out and the road becomes gravel. No matter. I peer over the hill and am wholly unsurprised to find another, just as tall and daunting, on the other side. Between the two is a steep descent and a steeper ascent. I push forward and coast down the former. For a moment, the sensation of wind on skin sends a pleasant chill through my body. I gather speed. Twenty, thirty, forty kilometers per hour. At the very bottom of the hill, dirt meets tar. The road is once again paved, and I hurtle toward its smooth, glinting blackness. I don't see it until it's too late. The gravel I am riding is not atop the tar; it is underneath it. It is the foundation for a new strip of pavement to be laid. It is the subfloor, and I am careening toward the edge of the hardwood. Blunt, sudden. Tall. Too tall. My front tire hits this edge, maybe a foot high, and my bike goes airborne. It and I fly forward onto the pavement, still upright for the moment. The wheel hits the ground and jerks every which way. I try to steady it, but I'm losing control. There's enough time to know I'm crashing but not enough time to stop myself from crashing. There's just enough time to look at the road and the concrete ditch and assess which one would be more forgiving on my bare skin. I opt for the ditch and cut left as my bike slides out from under me. I am vertical and then I am horizontal and then I am sliding against hot cement and using my own skin as a braking surface. I am sliding long enough to know that I am sliding and long enough to recognize that this is not very good. My body slows to a halt, and all is still.